For more than 30 years Leadership At Work has created clarity for its clients around the differentiation between LEADERSHIP and MANAGEMENT. After working with us, participants understand that they can have a healthy blend of leadership and management functions built into their roles; more importantly, they leave with the necessary tools to ensure they perform both functions at the levels their organisations expect. Two Trains, one optimum organisational destination. The conditions referred to within the Leadership at Work framework and the metaphor of the Leadership Train, could be considered as a unique carriage coupled together with other unique carriages containing the necessary knowledge, skills and tools. Management activity, unlike Leadership, is focussed on achievement of results (task focussed) through the efforts of others (relationship focussed). Whilst the Leader focusses on the role of pathfinder, the Manager might be described as the Path-minder. 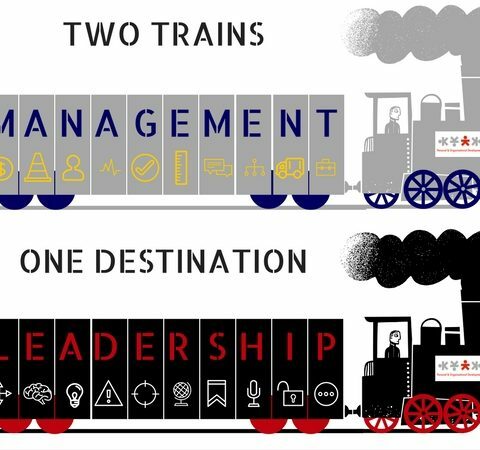 Like the conditions of leadership, Management skills and strategies can be regarded as unique, specialist carriages hitched to the Management Train, yet heading to exactly the same destination as the Leadership Train. Each carriage is a specific skill-set. Taking a look into the carriages we discover a specific set of skills necessary to become effective in the role. One such carriage, often missing from the Management Train, is delegation. Delegation can be a huge asset to a Manager when it is understood and applied appropriately. It can build confidence and promote extremely high performance in teams and individuals with high levels of technical proficiency. Conversely, it can be a generator of frustration and confusion when incorrectly applied. Organisations and those responsible for managing staff should explore whether they have the “delegation carriage” coupled up and if not, consider where and how this can occur. Our focus is on your needs. The Leadership At Work team is committed to upholding and enhancing their core value of growth. Under this mantra, we will be launching our Leadership and Management Train series of “carriage-specific” professional development sessions. These sessions will be delivered in half-day workshops in Ballarat and Geelong; the focus on specific skill sets (carriages) driven by either Management or Leadership. We look forward to offering you a whole range of options; stay tuned!